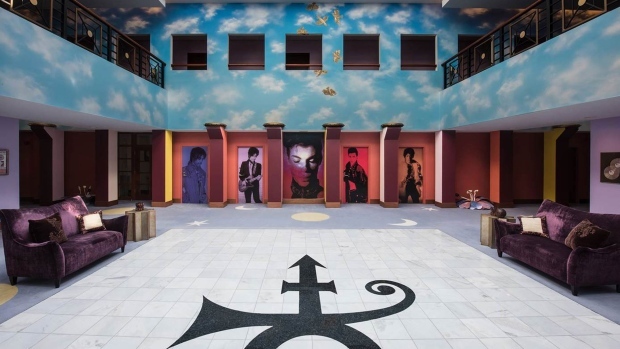 CHANHASSEN, Minn. -- Prince's Paisley Park studio complex and home reopened permanently Friday as a museum honouring his musical legacy, and the mayor of the Minneapolis suburb of Chanhassen declared it "Paisley Park Day" in celebration. The Chanhassen City Council earlier this month put the brakes on Paisley Park's planned Oct. 6 opening, citing concerns over traffic and parking. Only a limited number of tours were allowed under a temporary permit, disappointing fans who had already made travel plans. But the council signed off on the museum's rezoning request Monday after steps were taken to address traffic issues, allowing the gates to reopen Friday. "Prince was known to love all, and today we welcome the world to our city while extending an open invitation for fans to visit Chanhassen and this beautiful music landmark," read the proclamation from Mayor Denny Laufenburger. Visitors to the museum can see the studios where he recorded his hits, his guitars, "Purple Rain" motorcycle, costumes, awards and other memorabilia. Also on display is an urn -- a stylized replica of the building -- that contains Prince's ashes. Prince died at Paisley Park in April of an accidental painkiller overdose. The museum, managed by the same company that runs Elvis Presley's Graceland, is expected to draw 600,000 people a year. The 70-minute tour costs $38.50 while the 100-minute VIP tour costs $100. Additional fees are $11.75 per ticket.